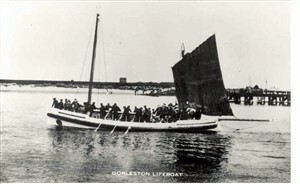 The Elizabeth Simpson was the Gorleston Volunteer Lifeboat from 1889 to 1939. 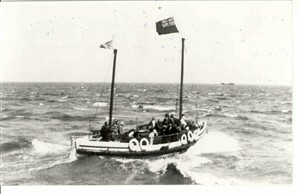 Operating as a private venture, independent of the RNLI boats, it was a 'Norfolk and Suffolk' type pulling and sailing lifeboat. The crew were mainly members of the Gorleston beach company known as the 'Rangers', based at Brush Quay. Photo 1. 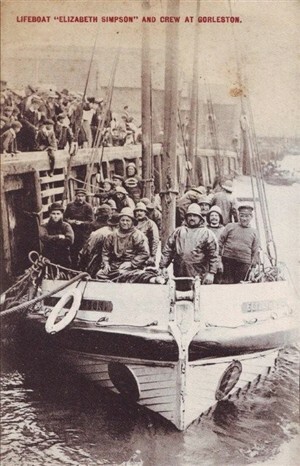 SB Daniels, in his book The Gorleston Volunteer Lifeboat "Elizabeth Simpson" (Poppyland Publishing, 1989), thinks this was the official photo for the launch on 23rd October 1889. Note the old type of lifejackets, made of cork. Photos 2 & 3. No dates for these. SB Daniels notes that the boat appears partially under sail and partially rowed. Also that "Norfolk and Suffolk lifeboats had to be rowed in the standing position". Photo 4. 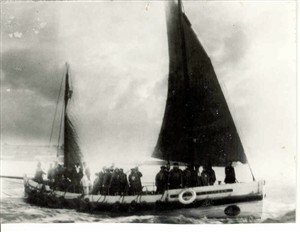 Mr Daniels, former honorary secretary to the Elizabeth Simpson, writes in his book that the boat was under motor power when the fourth photo was taken. This dates the photo circa 1926. Photo 5 shows an excursion returning to Brush Quay, probably in 1936. SB Daniels writes: "For some years the Ranger men had converted Elizabeth Simpson for passenger carrying during the summer, running sea trips for visitors from Brush Quay, using the slogan 'Help us in summer to save drowning men in winter'. I have this vessel in my garden waiting for the finances and someone to help me restore it. I also have an enormous amount of information, photo's books etc. For her age she is in very good condition! My uncle owned this boat in the 50s and I spent many summer days on board. At that time the steering position was futher aft than I believe it is now and she was powered by two marine petrol engines. My father was the engineer and she was skippered by an old boy from Lowestoft. 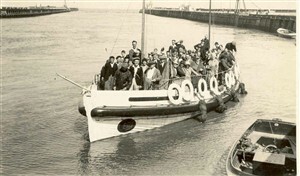 They used to run pleasure cruises from Lowestoft bridge. I believe the next owner fitted diesel engines and moved the steering position midships. Hi there. I worked on the Elizabeth Simpson 1970/71. The skipper was Billy Beales. We used to do three trips to Berney Arms. I think George Elliot, manager director of pleasure steamers, owned her. To Roy Masters. I have a very old post card of the Elizabeth Simpson, probably when she was new, or only a few years old. Is it of any interest to you? If so please let me know. My grandfather, Horace William Bowles, was a crew member on the Elizabeth Simpson, probably from the late 1800s to early 1900s. I have in my possession two medals that he received for rescues. The first one was for the ship Christean on October 14th 1903. The second medal says "37 lives saved from the SS War Valley by the Gorleston Lifeboats Elizabeth Simpson in 1919". Both medals carry his name. What a rescue that must have been in such a small boat with only 'man' power. I know nothing more about these or other rescues but would be very interested in more details. If only I had asked questions, but he died when I was a child. 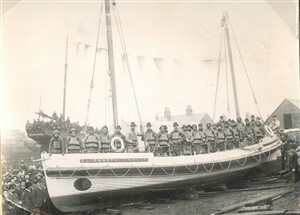 Winterton on Sea have recently rescued the Edward Birkbeck Lifeboat built by Beechings of GY in 1896. Do you have any information that may be of help to us in researching the background of our boat? If so, please email: woslifeboat@gmail.com. Thanks. My name is Roy Masters and I'm the owner of the Elizabeth Simpson lifeboat. I wonder if it would be possible to contact a number of the people who have commented on this site about her as I would dearly like to speak with them. Alternatively they could ring me if they wish; my telephone number is 01328 738910. Also I would like to extend an invitation to anyone that wishes to see or even go onboard this wonderful lifeboat. I must stress that anyone wishing to go on board are welcome but would have to climb a secure 8ft ladder. It's lovely to be able to read about my dear grandfather Stephen Daniels, and that people still talk about his work and life he dedicated to the Elizabeth Simpson, Gorleston and the RNLI. Some lovely pictures of him in his younger days too. for Marie Smith, if you wish to contact me I may well have more photo's of your grandfather, it was to Stephen I made a promise to save the Elizabeth Simpson. As above its Roy Masters on 01328738910. I was given around 40 glass plate negatives as a wedding present 11 years ago. Having scanned some of them, I find I have a few of the lifeboat Elizabeth Simpson in service and two of Belle Steamers in the Yarmouth River, plus a Yarmouth registered steam drifter. I would like these 100 year old negs to go to a good home with safe storage. Who would oblige me? For Roy. Do you still have the Elizabeth Simpson at Fakenham? and are you still willing for people to visit? Would love to see her again (I done the centenary tour as a child). My Grandfather and Great Grandfather both worked/ volunteered for Gorleston lifeboat. Unfortunately I don't know many details but am hoping to find out more over the coming months.